Click here for an anaglyphic example image. "How big, how much, how heavy?" 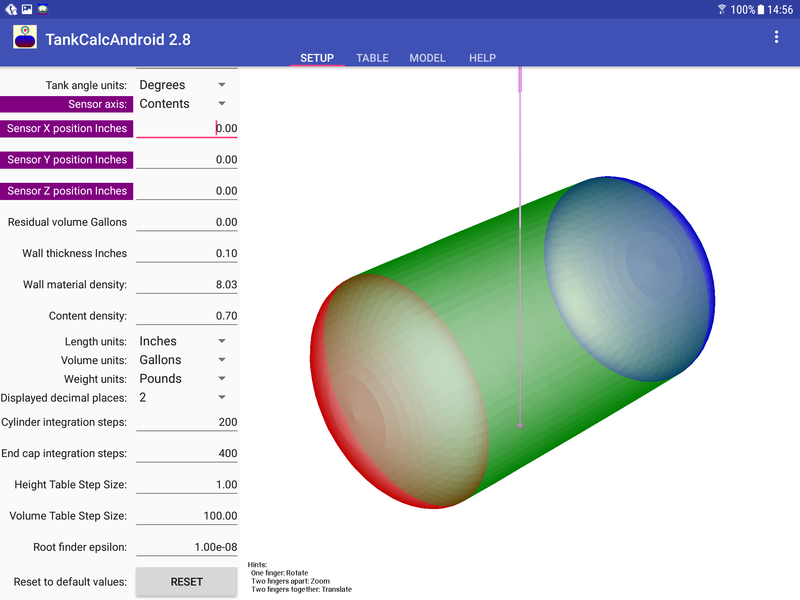 TankCalcAndroid is an Android-based version of my well-known storage tank analysis program TankCalc. I created it on hearing from a number of tank farm managers who wanted a more convenient way to analyze storage tanks in the field. This version includes most of the features of the desktop version — the table generator, the 3D viewer, even the anaglyphic true-3D viewing mode. It also has the ability to email its results to a user-provided address. Best of all, TankCalcAndroid is available at the same reasonable price as the original — it's free. There are no gimmicks or strings attached, and unlike so many Android applications, there are no ads. For those in government and safety-critical positions, TankCalcAndroid's source code is available for inspection and validation, and its mathematical methods are fully described at the TankCalc home page. 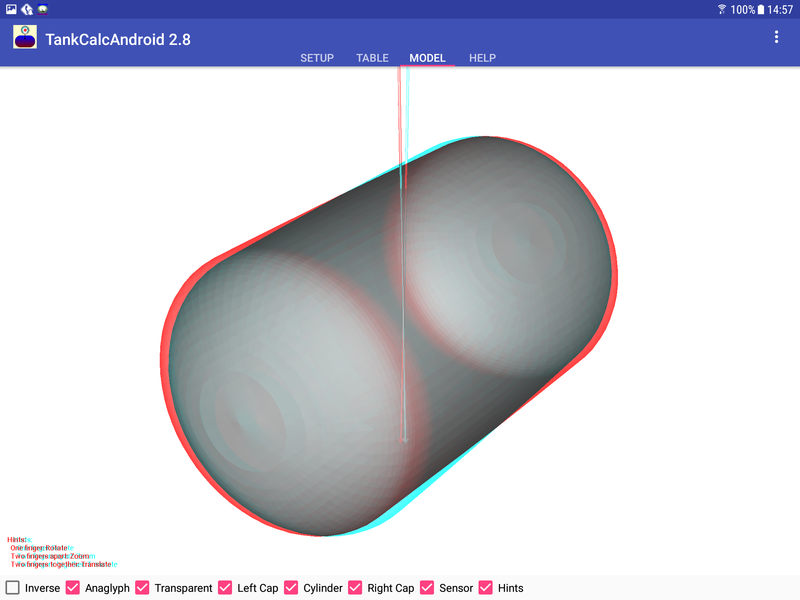 TankCalcAndroid requires Android version 3.2, API 13, or newer. Hello — I'm Paul Lutus, author of TankCalcAndroid. I've been writing software for about 35 years and have written some very well-known titles (Apple Writer, Arachnophilia). TankCalcAndroid is a fully functional Android-based version of my well-known storage tank analysis program TankCalc. I wrote it at the request of many correspondents in the storage business who have Android-based phones and tablets and who prefer not to lug a laptop around in the field. I hope you like TankCalcAndroid. And stay tuned — I'll be writing more Android programs in the future. 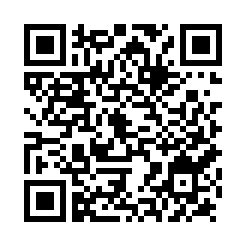 The easiest way to get TankCalcAndroid from a camera-equipped Android device is to take a picture of the QR code at the top of this page and download the result. Another way is to use another computer to download the TankCalcAndroid file, then download it onto your Android device. For programmers: TankCalcAndroid is open-source and licensed under the GPL. Click here to download the source archive. TankCalcAndroid is based on TankCalc and has the same features, but it's better-looking and (in most ways) easier to use. TankCalc, in turn, began as a practical example in my Calculus tutorial, in which I used a propane tank to show how one builds up from one dimension (length) to two (area), and then three (volume), in the course of learning Calculus. There was a time when the idea of running a numerical analysis program like TankCalc on a phone or tablet would have seemed overly optimistic, given the storage and speed requirements. But modern Android-based devices are more than fully capable of supporting programs like this — in fact, I now prefer the Android version for overall ease of use. Units: Input inches and output gallons. 33 seconds for a fully-formatted 2,117-record HTML table. 18 seconds for a plain-text format. Android-based Motorola Zoom: 36 seconds for a fully-formatted 2,117-record HTML table. This comparison may come as a surprise to some, but remember that all TankCalc versions run under Java, a virtual machine that isn't nearly as fast as native code on amy platform. Also, it turns out that, after the mathematical result is acquired, formatting and displaying a nice-looking, very long HTML table as in this example requires a significant percentage of the total running time. I emphasize that the above is a worst-case example — a table with 2,117 records, each requiring execution of an inefficient numerical root-finding method to create a volume-to-height table. Most uses of TankCalc produce a smaller height-to-volume table, which is much, much faster, typically measured in seconds (the same tank's height-to-volume table requires less than a second to generate on both test platforms). For complete use instructions and a full exploration of the mathematics behind TankCalcAndroid, visit the TankCalc home page. TankCalcAndroid is free, it doesn't show ads, it's not crippleware or shareware, and I don't want your money. I just thought I would make that clear up front. TankCalcAndroid is Copyright 2017, P. lutus and is released under the GPL. Here is a source archive for TankCalcAndroid, organized as an Android Studio project. 09.29.2017 Version 2.9. Recoded the activity creation method to speed things up and avoid some reliability and portability issues. 09.26.2017 Version 2.8. Major changes — TankCalcAndroid's data displays are now much more reliable, and its original application layout has been replaced. It now allows sharing of data tables by email, cloud storage and other methods, much more easily than in earlier versions. 04.19.2017 Version 2.7. Changed development environments (from Eclipse to Android Studio), fixed a number of minor issues, added functions to copy calculated CSV and HTML data to the Android system clipboard. 10.01.2015 Version 2.6. After many user requests, added a scaling factor entry to accommodate oval cross-section tanks. The help resource explains how to use this feature. 05.03.2015 Version 2.5. Fixed a bug in the table display that prevented normal updates. 09.18.2014 Version 2.4. Improved accuracy of method for computing wall volume. Originally multiplied wall surface area by wall thickness, now subtract tank total volume with wall thickness from tank total volume without. In most cases the difference between the two will be small. 08.06.2014 Version 2.3. Changed to a polygon-based tank graphic display as in TankCalc, much better appearance, added more features and controls including the ability to export a CSV-formatted data table. 07.25.2014 Version 2.2. Fixed a graphic display bug, added tank internal height to summary table. 07.22.2014 Version 2.1. Fixed some small bugs, refactored and restructured to increase shared code between TankCalc and TankCalcAndroid. 07.21.2014 Version 2.0. Corrected the end cap full wetted area computed value, fixed a bug that prevented reversion to the default configuration. 07.12.2014 Version 1.9. Updated this TankCalc version to agree with the desktop version, which now computes wetted area (liquid/tank) and surface area (liquid/gas) data fields. 02.05.2014 Version 1.8. Corrected tilted tank angle reading in summary table (calculation was correct, angle displayed was not). 08.16.2013 Version 1.7. Added tilted tank option that had been inadvertently left out. 07.13.2013 Version 1.6. Edited layout to try to accommodate small displays — smaller than TankCalcAndroid is really designed for. 11.14.2012 Version 1.5. Finally coded a successful solution to the the WebView/Unicode problem. 11.14.2012 Version 1.4. Tried a workaround for a bug in WebView (the table display) that prevents it from correctly rendering UTF-8 content. 11.06.2012 Version 1.3. Completed internationalization of this program. In earlier versions, some string resources were inaccessible to translation, which led to some confusing experiences in which some prompts were in English, and some were in other languages. 07.06.2012 Version 1.2. Fixed a bug that prevented correct volume computation when sensor axis wasn't perpendicular to liquid level. 02.23.2012 Version 1.1. Changed to a simpler rotate/translate/zoom method requiring only one or two fingers. 02.23.2012 Version 1.0. Initial public release. I apologize for the strict legalese below, but this program's calculations may be used to design and maintain fuel tanks and the possibilities for litigation have not escaped my attention. Sorry. The computations provided by TankCalcAndroid are provided on an "as-is" basis, without warranty of any kind, including without limitation the warranties of merchantability, fitness for a particular purpose and non-infringement. The entire risk as to the quality and performance of the computations is borne by you. Should the results prove to be in error, you assume the entire cost of any required service and repair, and any consequential damage. As customary in the computer business, you are solely responsible for any loss of profit or any other commercial damage, including but not limited to special, incidental, consequential or other damages. This disclaimer specifically disclaims all other warranties, expressed or implied, including but not limited to the implied warranties of merchantability and fitness for a particular purpose, related to defects in the computed results or the documentation.